I've had Lemony Snicket's The Composer Is Dead on my to-read list for a while, only familiar with bits and pieces of it. My library got it in for me via interlibrary loan, and now I know I must purchase a copy to have at the house. Although this musical murder mystery can be read on its own as a picture book, I feel The Composer Is Dead really needs to be experienced as a complete package: audio and book. 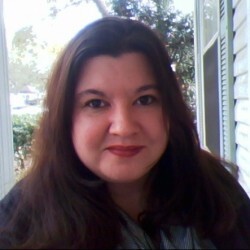 Set aside time (30 minutes) to really listen, take in and enjoy the music that occurs around the words of the story. Listeners will experience the instruments of the orchestra, musical terms such as waltz and cadenza, discover how the orchestra tunes, and learn a slew of names of famous (and dead) composers. Best of all, we are treated to the deliciously dark humor of Lemony Snicket. Word plays abound, and there are a number of inside jokes musicians will appreciate (flutes imitating birds, forgotten violas, loud trumpets). 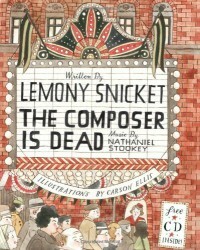 The Composer Is Dead is written and narrated by Lemony Snicket (Daniel Handler) and illustrated by Carson Ellis; the music is written by American composer Nathaniel Stookey and performed by the San Franciso Symphony. This brilliant and exciting work proves that classical music can be enjoyable and accessible to all audiences while keeping its musical standards high.